The space shuttle Endeavour's STS-134 crew arrives at NASA's Kennedy Space Center in Florida. CAPE CANAVERAL, Fla. -- The space shuttle Endeavour is officially "go" to launch on its 25th and last spaceflight this Friday (April 29), with NASA expecting record crowds and visit from President Barack Obama to watch the spectacle. NASA mission managers cleared Endeavour for launch this morning after meeting to review any concerns. "The orbiter itself, Endeavour, is in great shape," said Mike Moses, chair of the shuttle mission management team. "We had an easy poll to say were ready to go. We're looking forward to Friday's launch." Six astronauts will launch aboard Endeavour for a two-week trip to the International Space Station to deliver an astrophysics experiment to hunt for dark matter and other mysteries of the universe. Endeavour will also carry up a plethora of spare supplies to help outfit the space station for the era after the space shuttles retire. President Obama and his family intend to come watch the launch at the seaside spaceport. It will be only the third time a sitting U.S. president has watched a space launch in person, and the first time the entire First Family watched a liftoff. "The team is upbeat," shuttle launch director Mike Leinbach said of the shuttle ground team. "They're all excited about the mission, the president showing up." "You're never quite sure what the final plan is until it's done," Leinbach said. "We have good plans in place, we'll see how it turns out." Another high-profile attendee of the launch will be Congresswoman Gabrielle Giffords (D-Ariz.), whose husband, Mark Kelly, is commander of Endeavour's STS-134 mission. Giffords survived a January assassination attempt when a shooter opened fire on her and others during a constituent meeting in Tucson. "She's NASA family and we're treating her just like we do the rest of the families," Moses said. "We're very pleased she's coming to the launch and supporting Mark and his flight." 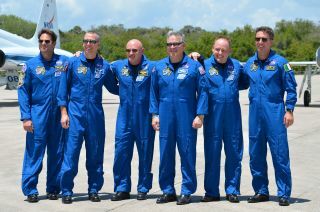 Kelly and his five crewmates arrived at Kennedy Space Center yesterday afternoon to prepare for the mission. NASA began the launch countdown Tuesday at 2 p.m. EDT (1800 GMT).